In the Elder Scrolls fantasy video-game series, the Khajiit are a fictional race of cat-like creatures whose stealth and agility make them accomplished thieves and warriors. The Khajiit spy Razum-dar will be involved with the plot and players will get to meet the sages of the Crystal Tower in this sweeping adventure where they fight against a Daedric conspiracy that could destroy all of Tamriel. If I remember right, there is a breed of Kajiit [sic] that are very similar to the size of a house cat. I don’t think the other kajiit [sic] treated them differently but I am by no means adept in Khajiit lore. So maybe the other breeds have to first figure out if they are dealing with a house cat or a Khajiit so they have a special ritual they have to do to figure it out? 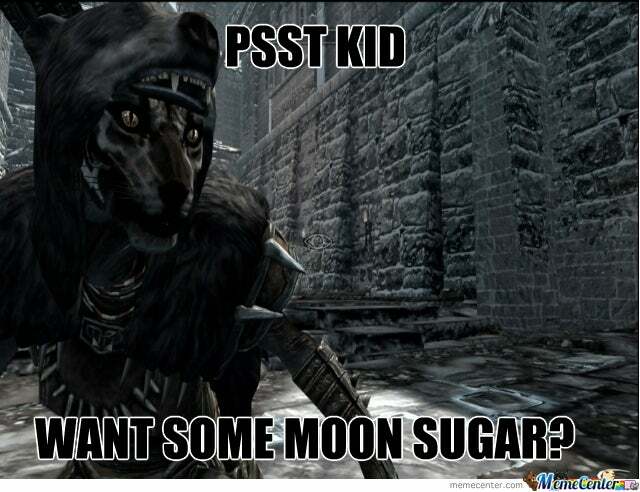 Maybe offer the cat some moon sugar? Where does Khajiit come from? The fictional Khajiit race first appeared in 1994 with the release of Arena, the first installment of the first-person role-playing game (RPG) franchise, Elder Scrolls, developed by Bethesda Game Studios. The Khajiit are one of 10 fictional races in the Elder Scrolls series. Each race is given different baseline powers, strengths, and abilities, as reflected in-game by skill sets and a point-system. Before the game, the player creates a character by selecting a race (e.g., Khajiit) and determining a number of other features, including gender, social class, and character name. In the game, the word Khajiit derives from the race’s fictional language, Ta’agra. Khaj means desert, -iit denotes personhood, making the combined form roughly mean “desert-walker,” a fitting name for the Khajiit’s arid homeland. Khajiits are usually bipedal, humanoid cats who come in a variety of shapes and sizes that can resemble more ferocious cats like lynx, cougars, and tigers as well as domesticated breeds. They wear colorful cloth shawls, jewelry, and sport leather and burnished-metal armor in battle. Relative to other races, Khajiits are highest in the “Sneak” skill and possess other skills in alchemy, archery, lockpicking, and pickpocketing, hence their association with thievery. They also excel in trading, reconnaissance, and battle. Being a Khajiit offers players the opportunity to explore the Elder Scrolls realm as a thief, warrior, or assassin. Both in terms of visual characteristics and narrative backstory, the Khajiit race has undergone many evolutions in the decades-spanning history of Elder Scrolls games. 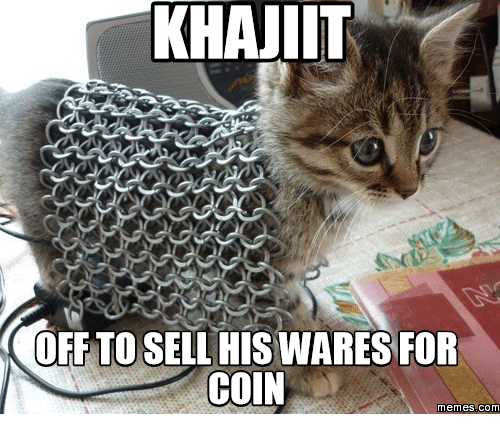 The release of the third installment, Morrowind, in 2002 introduced players to Khajiit sub-breeds and their penchant for sweets—especially Moon Sugar, a popular export commodity that became a trademark of the Khajiit race. The launch of Elder Scrolls Online in 2014 expanded the game’s popularity by transforming the single-player console game into a massively multiplayer online role-playing game (MMORPG), where players interact in real time. As the game became more popular online, so did the increasingly complex Khajiit character. 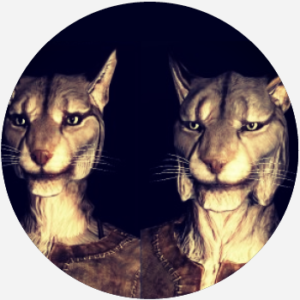 Much is now known about the Khajiit thanks to the cooperative efforts of developers and players who create wiki resources describing Khajiit origins, religion, culture, history, and lore. Khajiit is most often referenced in Elder Scrolls gameplay and in discussions about the game, which are mainly in online forums. Players are often young or middle-aged men. One popular discussion on Elder Scrolls forums considers whether the Khajiit are subject to racial discrimination. Race-based prompts are built into the game itself. At the beginning of Skyrim (2011), a scripted character responds to a Khajiit: “You with one of the trade caravans, Khajiit? 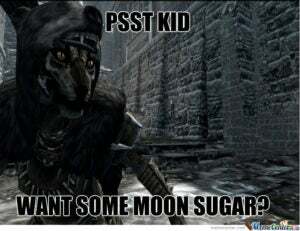 Your kind always seems to find trouble.” The “trouble” is in reference to the Khajiits’ talent for thievery and their skillful trade in Moon Sugar and skooma, a drug made by distilling it. Gamers recognize and exploit those racial distinctions during play, using slurs against Khajiits that often allude to their bestial appearance, such as “cat,” “rug,” or “carpet”—the latter two implying the Khajiit can be skinned for a decorative accessory. However, other gamers, notably Khajiit players themselves, celebrate the Khajiit’s distinctive appearance and skills, even reclaiming epithets like cat used against them in gameplay. Khajiiti, along with Khajiits, is sometimes used as the plural, collective, and adjectival form of Khajiit.